This is a very pretty scene. It shows travellers walking along the track by a fast flowing stream on a clear morning after heavy overnight snow. Snow scenes can be very monochromatic, as with this, but the artist has added bits of colour to break the dreariness. Some of the travellers have colourful coats, the river is a rich blue and the morning sky has a tinge of pink/red. 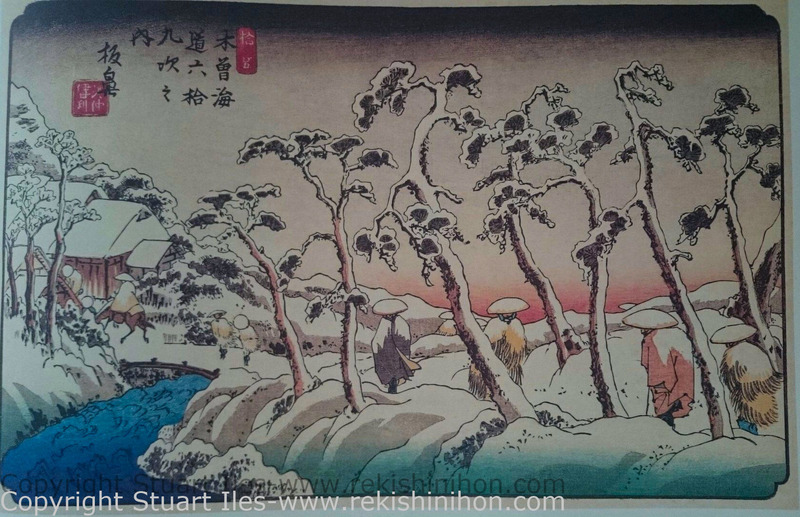 The frieze of pine trees has been influenced buy Katsushika Hokusai, whose “Fuji from Hodogaya on the Tokaido” from the “Thirty six views of Mt Fuji” published a few years earlier which uses a similar style. This print has never been signed but is attributed to Keisai Eisen. The drawing appears to be in Eisan’s hand and the titling in Hiroshige’s script and format. A scholar of Hiroshige suggests that when Eisan left the project this image was incomplete and may have been finished by Hiroshige himself. It is however recognised as one of Eisen’s most famous snow scenes.